The Brazil international has endured a tough season with the Catalan giants where he has regularly found himself starting from the bench. Owing to this, he has recently been touted to make a shock return to the Premier League with United but Mundo Deportivo claims that won't be the case. 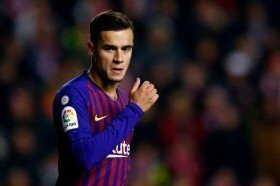 It is added that Coutinho is still assessing his future with the Spanish champions, although he is willing to wait until the summer to ensure whether he can reclaim a regular starting role under Valverde. Coutinho is currently being utilised on a regular basis from the bench with Ousmane Dembele getting the nod to feature alongside Lionel Messi and Luis Suarez in the three-man frontline. The Brazil international has contributed 16 goals and 10 assists for the Spanish giants since joining them from Liverpool at the midway stage of the previous campaign.